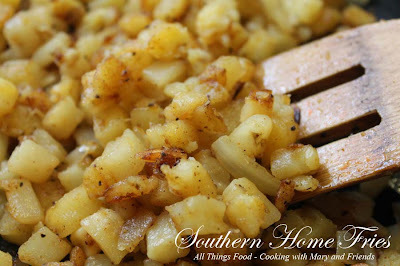 Simple foods are many times the BEST EVER and this is probably the simplest thing you'll ever make, but so delicious! You know everyone in your family has a "favorite" and this is my daughter's all-time favorite breakfast food. Heaven help me if she comes home for a visit and we don't do at least one BIG cooked breakfast. You know the kind with pancakes, eggs, Southern home fries, sausage gravy & biscuits, bacon (lots of bacon), grits, orange juice, coffee and more! A big breakfast is what we typically serve the day after Thanksgiving. Usually those family members who have traveled are heading home, so this is a nice send-off, because everyone leaves with a belly full of yumminess! And if they're not leaving, then hey, this holds them all off until they hit the leftovers that afternoon. 1 bag - 32 oz. 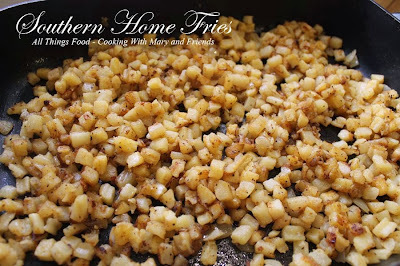 frozen southern hash browns (cubed potatoes) or 4 cups diced, cubed potatoes (use a firm potato such as Red or Yukon gold, not Russet) *Pro Tip - don't crowd the pan. If you're making a larger batch, cook them one bag at a time. In a large electric fry pan (or heavy fry pan with lid), melt butter and oil at 350 degrees.Add frozen potatoes (or fresh, cubed potatoes) and diced onion; stir to coat with butter and oil mixture. Sprinkle season-all and pepper on top and stir again to evenly mix. Cover fry pan and cook 3-5 minutes. Remove lid, allowing condensation from the lid to drip into the pan. Using a spatula, mix around to ensure they are not sticking. Cover and cook for an additional 5 minutes. 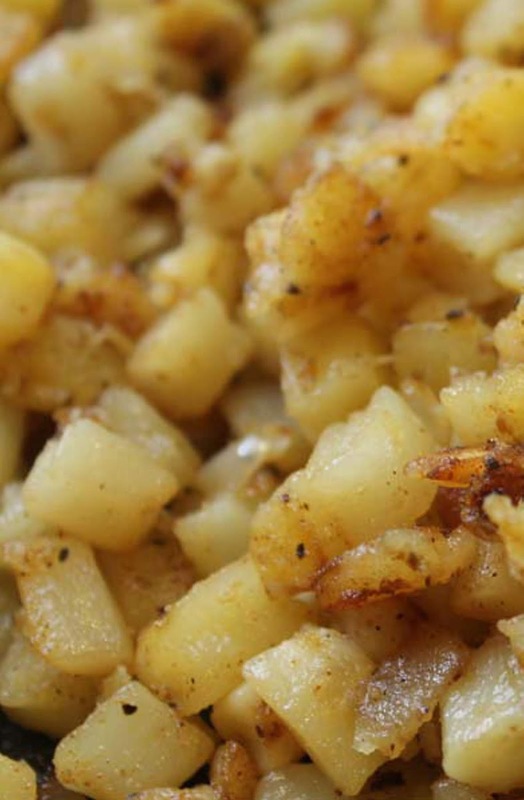 Potatoes should be getting cooked but not mushy. After about 5 more minutes (cooking time may vary), remove lid and allow potatoes to brown. Stir occasionally to prevent sticking and to ensure even cooking/browning, but refrain from stirring too much. You want them to brown and crisp up! Potatoes are done when they are brown and crisped on the outside, and the oil and butter is absorbed. Serve immediately. Cook's note - Freezes very well. Allow to cool, then bag and freeze. When ready to use them, simply thaw and bake, uncovered in 350 oven until heated through.